The news from the domestic market could have been better for the Indian automobile industry. As per the latest sales numbers released by the apex body SIAM for December 2018 and the first nine months of the ongoing fiscal year FY2019, it looks like all of 2019 will be a challenging year. Overall industry growth for all segments – Passenger Vehicles, Commercial Vehicles, Three-Wheelers and Two-Wheelers – has slowed down and the total sales in the April-December 2018 at 20,311,114 point to a 9.63 percent year-on-year growth, lesser than the 11.28 percent growth industry clocked in the April-December 2017 period. Let’s take a quick look at the December 2018 sales/despatch numbers. Coming on the back on tepid growth right from September 2018, last month’s sales data depicts a rather grim situation. 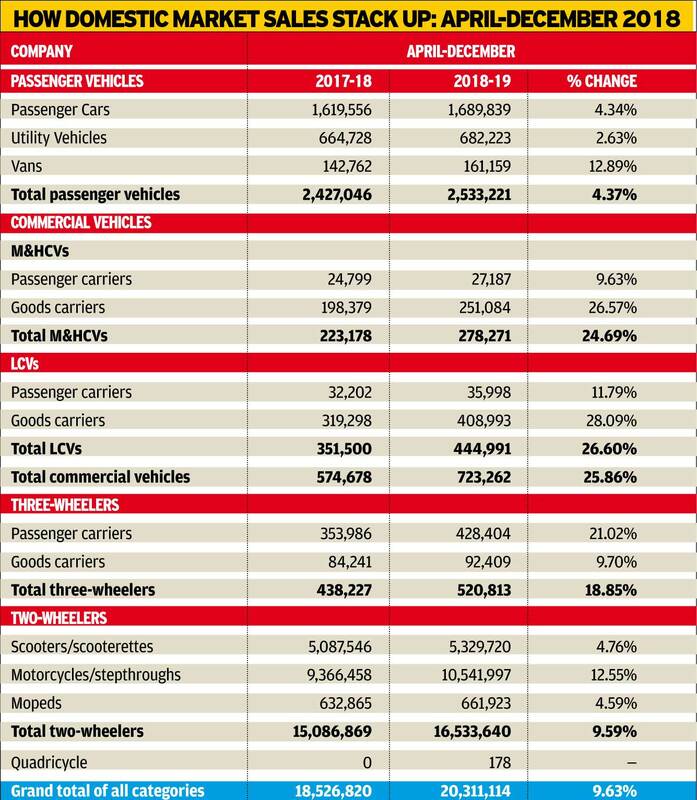 All vehicle segments are in negative territory – PVs (238,692 / -0.43%), CVs (75,984 / -7.80%), three-wheelers (43,650 / -23.39%) and two-wheelers (1,259026 / -2.23%). Do the math and what you get is a sum total of industry sales in December 2018: 1,617,356 which is down 2.97 percent on the year-ago sales (December 2017: 1,666,878). December though is a month which tends to take a hit as buyers, particularly in the PV and two-wheeler segments, prefer to delay their purchases to the new year. 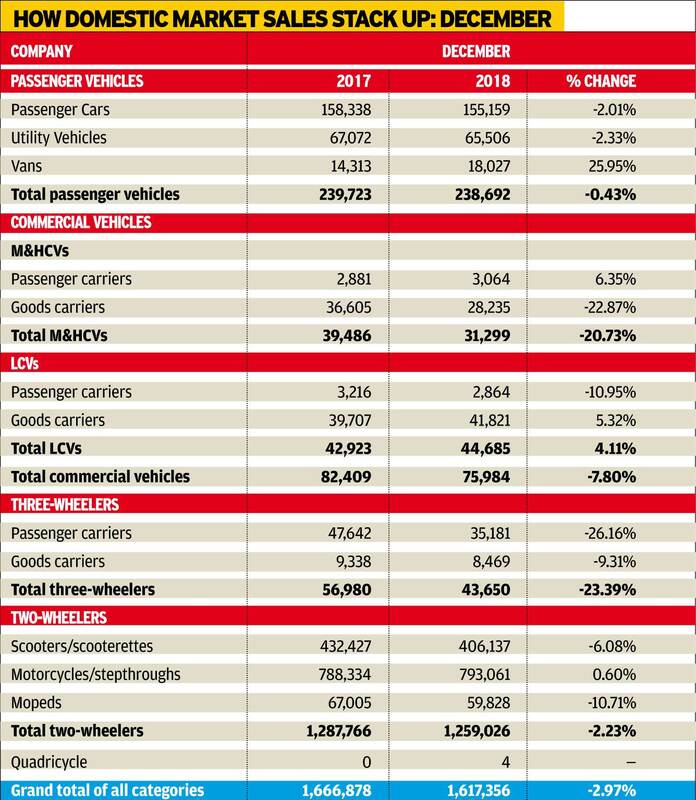 See the detailed December 2018 table above to see the extent of the red ink across vehicle categories. Nine months ago, when FY2019 opened, industry captains were of the opinion that robust growth was here to stay what with FY2018 having closed on a strong note: a tad short of the 25 million mark (24,972,788) and a YoY growth of 14.22 percent. All vehicle segments were firing on all cylinders and all barring PVs were scoring double-digit growth (PVs: 7.89%, CVs: 19.94%, 3-wheelers: 24.19%, two-wheelers: 14.80%). For the April-December 2018 period or the first nine months of FY2019, growth clearly has slowed down, impacted by a number of factors including high fuel prices between August to early November, a liquidity crisis, poor consumer sentiment and rising commodity prices. As such, growth for all vehicle segments have been affected adversely – PVs: 4.37%, Cvs: 24.69%, three-wheelers: 18.85% and two-wheelers: 9.59%. See the table below for full details. Importantly, growth in each of the individual segment drivers has been impacted. For instance, in the PV segment, the UV segment, which not only buffered passenger car sales but helped accelerate overall PV numbers is now down to 2.63 percent. In FY2018, the UV segment had clocked handsome 20.97 percent YoY growth. It’s the same case with scooters, whose growth curve seems to be similar to UVs. In April-December 2018, scooter sales growth has slowed down to 4.76 percent; for FY2018, it was a strong 19.90 percent. Domestic market despatches have grown by 9.59 percent YoY during the first three quarters of the ongoing financial year (FY2019). Cumulative numbers for the April-December 2018 period stood at 16,533,640 units as against 15,086,869 units a year ago. Motorcycles outperformed scooters and mopeds in terms of the local despatch volumes during the period. While motorcycles recorded a YoY growth of 12.55 percent (increasing from 9,366,458 units to 10,541,997 units), scooters and mopeds registered relatively slow progress of 4.76 percent and 4.59 percent YoY respectively during the nine-month period. The scooter volumes rose from 5,087,546 units to 5,329,720 units during Q1-Q3 FY2019. Mopeds, on the other hand, recorded despatches of 661,923 units from TVS Motor’s manufacturing units during the same period (April-December 2017: 632,865 units). At 1,259,026 units, December 2018 turned out to be a drab month with despatches recording a dip of 2.23 percent YoY. This can be attributed to the YoY decline in the scooters’ (406,137 units, down 6 percent) as well as mopeds (59,828 units, down 10.71 percent) volumes. Motorcycles, on the other hand, remained flat at 793,061 units, thus registering just 0.60 percent growth YoY. SIAM has also released CY2018 performance volumes, which reflects better growth in the despatch volumes. Two-wheeler volumes grew by 12.84 percent YoY in CY2018, which cumulatively recorded 21,645,169 units (CY2017: 19,182,688 units). The motorcycle segment continued to dominate the scooter and moped categories during this time frame too. While motorcycles recorded a YoY growth of 15.59 percent, scooters and mopeds registered 8.79 percent and 4.65 percent respectively during CY2018. After maintained sustained growth for the first eight months of FY2019, the CV segment’s sales have fallen for the first time in December 2018, largely due to the higher base effect of December 2017 which saw a huge uptick of pre-buying due to the upcoming regulations on air-conditioned cabins. In December 2018, total CV sales were 75,984 units down 8 percent. (December 2017: 82,409). 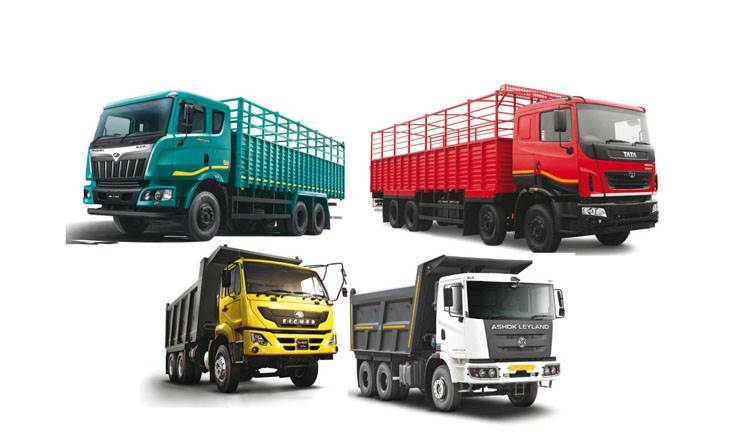 The medium and heavy commercial vehicle (M&HCV) segment, which was growing upward of 30 percent, has declined 21 percent in the month as the goods carrier segments saw a sharp correction after the increase in axle norms which have created additional capacities in the industry. For the April-December 2018 period, CV sales remained strong thanks to the rapid growth in the first two quarters of FY2019. In April-December 2018 with total sales of 723,262 units, up 26 percent, M&HCVs and LCVs both grew 25 and 27 percent respectively in the same period. In the January-December 2018 calendar year, overall CV sales crossed the one-million mark for the first time with total sales of 1,005,380 units, a growth of strong 27 percent. The steep fall in the M&HCV segment is partially due to a drop in cargo sales due to low consumer sentiment. Besides this, there is the impact of the additional capacities in the current heavy truck parc where vehicles are registered for higher payload due to the increase in axle load norms. After a strong start to FY2019 with over 30 percent growth in the first six months, sales moderated in November and declined in December for the first time. Market analysts see the last two months dip in sales as a short-term blip and the last January-March quarter of FY2019 likely to see higher sales for the sector due to ongoing infrastructure projects across the country and also upcoming general elections. In anticipation of a strong last quarter of FY2019, the overall CV sales are expected to touch the million-unit mark in a fiscal year for the first time after record sales in FY2018. From the looks of it, India Auto Inc will end FY2019 with single-digit growth compared to the 14.22 percent it had clocked in FY2018. In FY2017, YoY growth was 6.81 percent. Nonetheless, the Indian automobile industry, which is actively engaged and working with its component suppliers in the upgrade to BS VI, believes better growth will come down the line. Given the government's focus on agricultural and rural development as well as continued spend on infrastructure development, sustained demand for vehicles from rural India and for the CV sector respectively should be there. There will also be considerable pre-buying of BS IV vehicles in FY2020 before BS VI emission norms are implemented from April 2020. "For us, the nine months so far has been period of growth and most of the segments have witnessed growth, However, Q3 has seen de-growth elements in many of the segments and that's largely because the festive season this year (October-November) was as not good. A lot of sentiments didn't go well with the consumers largely in the area of buying SUVs and cars and also similarly the commercial vehicle segment has got impacted because the axle-loading norms have changed the requirements for the products with more capacity available. Also, the non-availability of funds has resulted in slowdown of the CV industry, but we firmly believe in the growth story of the country and believe that Q4 will be better than Q3 and the total year we will end-up with definite growth." Challenges in the domestic market could come in the form of political uncertainty, given that elections are a few months away. Also, after three back-to-back normal monsoon seasons, the risk of a sub-normal monsoon is high. What’s more, 2019 is packed with a slew of highly-anticipated vehicle launches, across segments, as a result of which growth momentum is expected to return to the industry.